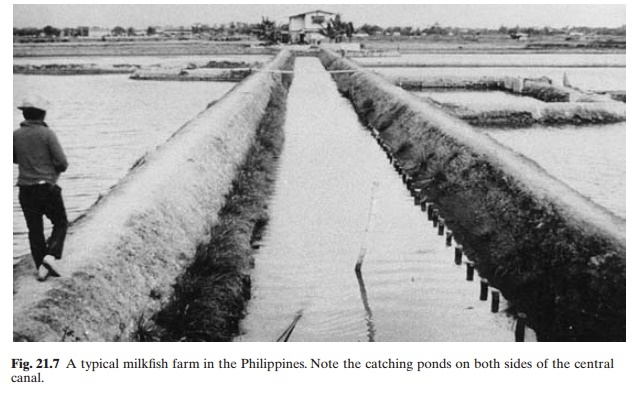 The most common system for the culture of milkfish is in brackish-water coastal pond farms (fig. 21.7). The most common system for the culture of milkfish is in brackish-water coastal pond farms (fig. 21.7). The farm may include nurseries and rearing ponds, with wintering ponds where the fingerlings have to be over-wintered, as in Taiwan. Some farmers specialize in the production of fry and fingerlings only, in which case rearing ponds may be omitted. Another type of farm has only rearing ponds of different sizes. The farmer buys fry or fingerlings from fry producers and devotes his farm only to raising marketable fish. Though intended to be monoculture, brackish-water milkfish ponds become polyculture systems as the tidal water brings in early stages of a number of other species, the more important of which are the grey mullets, shrimps and sea-bass (Lates calcarifer). As in the case of mullets, milkfish are some-times grown in fresh-water ponds or stocked in lakes and reservoirs. But the more important milkfish farming in fresh waters is the pen farming that has developed in lakes in the Philippines (Laguna de Bay and Lake Sampaloc).